LEFT: Jim Chaik of PineForest points out where the burglar broke the window, and squeezed between bars. RIGHT: Three empty display cases attest to the huge loss. NORTH CHANNEL – A single burglar managed to get past barred windows and alarm systems, to break into PineForest Jewelry on Uvalde Road last Saturday morning. According to owner Jim Mills, the burglar was in the store for over 2 hours, filling a bag with gold and jewelry. He also took an M1 rifle. Mills estimated the loss at between $300,000 and $400,000. Surveillance video showed the man approaching the building, squeezing through a narrow window opening he made by breaking glass, and then methodically opening jewelry display cases and taking what he thought was most valuable. Strangely enough, at one point the man left the store, stole Mills SUV and drove it away, only to return it about two hours later. No explanation was available for this action. Mills has described the burglar as large build, Caucasian or Hispanic, with tattoos on his lower back and ankle. There is a $1000 reward for information and conviction. 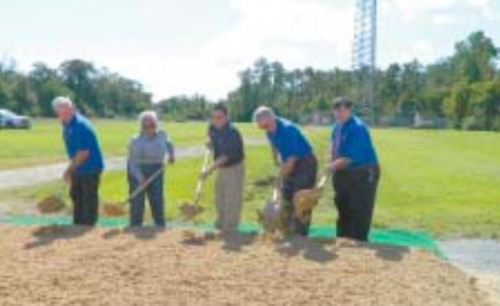 GROUNDBREAKING FOR THE NEW EHC CALL CENTER took place Thursday, Oct. 13 at the site of the future building, at 16010 Ridlon Street in Channelview. Participating in the Shovel & Dirt ceremony were representatives of the five Participating ESDs, who now comprise the new ECOM board. Above, Eric Stricklin, HCESD#50, Danny Naramore, HCESD#6, Helen Lauersdorf, HCESD#60, Charles Anthony, HCESD#2, and William Anders, HCESD#12. EAST HARRIS COUNTY – Five Emergency Service Districts have combined their 9-1-1 dispatching duties, into a new collaborative agency known as ECOM, or Emergency Communications. They plan on operating out of a new building, to be built on Ridlon Street in Channelview, and they broke ground for this building last Thursday, Oct. 13. On hand were representatives of the five ESDs that have formed ECOM, and other interested parties. The new East Harris County Emergency Communications Center will receive emergency call through the Greater Harris County 9-1-1 network. The Center will dispatch emergency medical service events or fire service related events for five area emergency agencies. The five emergency agencies provide services within an area located North of the Houston Ship Channel, East of the Houston City limits, South of Lake Houston, and West of the San Jacinto River. The 5,500 square foot facility will house the equipment and personnel needed to efficiently receive and dispatch the five agencies. The Center is designed to withstand hurricane force winds, and will have redundant systems to assure uninterrupted services 365 days a year. 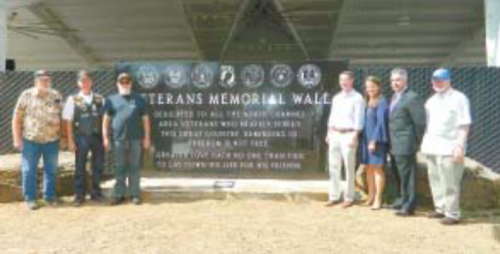 NORTH SHORE ROTARIANS dedicated this new Veterans Memorial Wall on Thursday October 13. The wall stands at the end of the pedestrian bridge in the North Shore County Park on Wallisville. In this photo, at left are Veterans representing their services, and at right, Pct. 2 County Commissioner Jack Morman, Rotary President Kim Gonzalez, Rotarians and chairman of this project Mike Williams, and Rotarian and Veteran Frank Nadolney.